Molecular imaging is unlike any other imaging technology. It enables the search for the kind of discovery that provides reproducible evidence of what is seen and often not seen. We call this a true discovery. It’s the type of discovery that gives you confidence in the accuracy of what you see and in your ability to find disease sooner. It goes hand-in-hand with your drive to provide the best possible patient outcomes for as many patients as you can. To do this, you need more than quality images and accurate quantitation. You also need imaging technology that allows you to cost effectively grow your practice and reach people living in remote places. Our mission is to give you the tools you need to provide the best possible patient outcomes to more people in more places. We can accomplish this by providing you with a high-performance system that produces quality images with less dose that can also easily accommodate your needs as they grow. But to truly reach more people, you need the same clinically impactful technologies on a system that is mobile ready. This is exactly what we designed Discovery™ IQ to do. We put as much energy into the efficiency, productivity and profitability of its design as we did into its revolutionary technologies, allowing you to get the most out of your asset. We built it on a mobile-ready platform and engineered a new PET detector technology called LightBurst. It provides quality images with accurate quantitative information, but also addresses key factors like dose and scan times. We also made it scalable, which gives you the flexibility to start with a two-ring detector and gradually upgrade up to a five-ring detector. No matter what your clinical environment may be, Discovery IQ is the right PET/CT solution to help you bring true discovery to more people. With Discovery IQ, we had two main goals. We wanted to build a system with the clinical solutions that high-performance clinical environments require. But we also wanted to make those solutions accessible to providers looking to bring PET/CT capabilities to new communities and remote locations. We focused on the variables that directly affect clinical outcomes to develop technology that really makes a difference, an innovative PET detector that cuts scan times and dose amounts in half.1 The LightBurst PET Detector technology was the result. Along with the highest clinical NECR for18 F and the highest NEMA sensitivity ratings in the industry, it has Dual Acquisition Channels to give you the high-count recovery needed to deliver quantitative accuracy.2 It does more than increase the clarity of the image. It increases the speed that you acquire it, helps to reduce the dose you expose your patient to and aids in strengthening your confidence to see smaller lesions. To make Discovery IQ accessible to more people in more places, we designed it on a mobile-ready platform. We also designed it to be scalable. Depending on your clinical needs, you can start with a two-ring configuration and gradually upgrade to the five-ring configuration with a large, 26 cm field-of-view coverage. 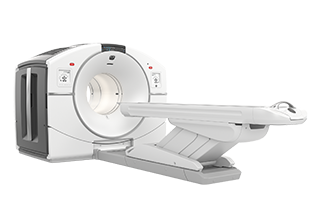 We paired this innovative detector technology with a CT system designed to meet your routine imaging needs. Optima™ CT540 has the equivalent speed of a 50-slice CT with IQE 1.75 pitch booster.3 Its excellent signal management delivers outstanding image quality in signal starved areas like shoulders, hips, areas with metal and in larger patients. In addition, ASiR™ reconstruction keeps dose low4 and a 0.5 second rotation speed combined with 20 mm coverage delivers fast exams with short breath holds. Quantitation helped establish PET/CT as a valuable clinical tool. It provided an important starting point to find and follow disease throughout the course of treatment, but it was limited by the technologies used to produce it. Now, consistent, accurate SUV measurements are possible with Q.SUV. The ‘Q’ is important. It signifies the SUV measurement was produced exclusively from our innovative PET image reconstruction technology, Q.Clear, which delivers not only up to a 2x improvement in PET quantitation accuracy (SUVmean), but also up to a 2x improvement in image quality (SNR). For this reason, Q.Clear is a critical component of Discovery MI. Q.SUV is more than a starting point for clinical decisions. Because it is more accurate and consistent than conventional methods, it becomes more than a number, it becomes a tool for communication. As a result, it sharpens communication between radiologists, oncologists and patients. Be sure your SUV starts with a ‘Q’. Nothing is more personal to your patients’ PET/CT experience than dose. As you continue to look for technology and tools that can help you deliver personalized care from disease detection through treatment assessment, you need clinical solutions that allow you to personalize dose as well. We are more than just committed to lowering radiation dose during scans, it's a passion of ours. Discovery IQ was engineered to ensure the highest quality of PET/CT care available at the lowest dose possible. The same technologies that improve image quality and quantitation also lower dose requirements, like the high NEMA sensitivity of the LightBurst PET Detector and Q.AC, an advanced image reconstruction technique that reduces dose up to 20x for CTAC. In addition, Discovery IQ includes a low kV choice that allows small patients to be scanned at 80 kV and easy-to-use management tools that help clinicians track patient dose histories and balance image quality with dose. An important part of personalizing care is making it more accessible. Historically, it’s been challenging for providers serving rural communities to bring PET/CT capabilities to those areas. In addition, providers in growing communities need affordable technologies that have the flexibility to evolve with their clinical and financial needs. Developing clinically impactful technologies is only one aspect of our commitment to helping you grow and protect your clinical offering of PET/CT. 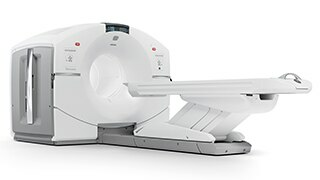 Discovery IQ was designed to be one of the most adaptable and accessible PET/CT scanners available. Built on a mobile-ready platform, it allows you to bring a high-performance system to areas where access has been limited. We also built it with a fully-scalable detector ring, giving you the option to start with a two-ring detector and through a simple, onsite upgrade, you can transition up to a five-ring detector when you need it. Discovery IQ is built on a mobile-ready platform, so you can bring high-performance PET/CT to more people in more places. In molecular imaging, every patient is an opportunity to make the true discovery that will change their life for the better. An opportunity to find the deeply hidden truth about their own disease. It’s an opportunity you take seriously as you work hard every day to influence the lives of as many individuals as possible. Our mission is to help you in yours. That’s why we built Discovery IQ with the clinically impactful technologies that everyone requires and then made it both mobile ready and scalable. It’s the right PET/CT solution for both first-time users and providers in high-volume or research departments. More importantly, it’s the right system to help you bring true discovery to more people in more places. 1Comparing Discovery IQ 5-Ring to Discovery IQ 3-Ring. 2Comparing Discovery IQ 5-Ring to other PET/CT scanners reported in ITN online comparison charts (Apr 2014). 3Image quality as defined by an Artifact Index in Phantom testing. 4ASiR is an optional feature in Discovery IQ. In clinical practice, the use of ASiR may reduce CT patient dose depending on the clinical task, patient size, anatomical location and clinical practice. A consultation with a radiologist and a physicist should be made to determine the appropriate dose to obtain diagnostic image quality for the particular clinical task. 5 IMV PET 2012 Imaging Mkt. Sum. Rpt. 6 At the typical activity concentration for FDG of 2.4 kBq/mL for Discovery IQ 5-Ring.